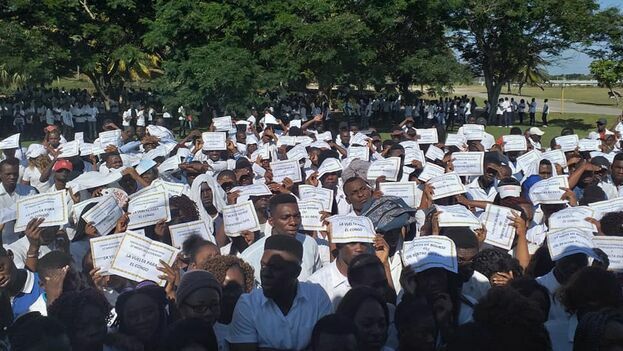 African students banded together on social media under the slogan "I Won't Go Home without My Diploma"
14ymedio, Havana, 12 April 2019 -- Los estudiantes congoleños que esta semana protagonizaron una protesta, en La Habana, han pedido disculpas a Cuba en una declaración publicada este jueves en Facebook. La declaración llega pocos días después de una gran operación represiva contra ellos por parte de la policía y militares de la Isla. 14ymedio, Havana, April 12, 2019 — Congolese students who staged a protest this week in Havana have apologized to Cuba in a statement posted on Facebook on Thursday. The declaration comes a few days after a major clampdown on them by the island's police and military. The African students joined together on the social network under the heading ˝Je Ne Rentre Pas Sans Mon Diplome˝ (I Won't Go Home without My Diploma). In the post they explained that they do not hold Cuban authorities responsible for the non-payment of their stipends. Instead, the Congolese students blame their own country's government for the twenty-seven month delay in payment. "We wholeheartedly extend to the Cuban people our sincere apologies for the inconveniences and misunderstandings caused by comments and photos published on this page," wrote the students, who were part of a peaceful protest at the Salvador Allende School of Medicine in Altahabana. The statement, which was immediately picked up by the island's official press, explains that the students' motivation in calling the strike was not to criticize Cuba The sole intention, they explained, was to "draw attention and awaken the conscience of Congolese authorities." The students denounced their country for abandoning all of them to the care of the Cubans "without the sligtest remorse." They added, "During last twenty-seven dark months we could only count on the support of Cuba and, in some cases, of our families." They did not mention, however, the repeated criticisms some of them had made about the poor quality of the food they received at the medical school or poor housing conditions. Cubadebate, an official media outlet that published the Congolese' letter, took the opportunity to attack what it considered to be a "political manipulation" of the issue.